Air pollution levels in Central and Causeway Bay violated global health and safety standards for almost 280 days in the past year, with Des Voeux Road and Hennessy Road experiencing the worst levels of fine particulate matter on Hong Kong Island, a new study has found. The air quality study, results of which were announced on Thursday, measured fine particulate matter known as PM2.5 in the air on the northern shore of Hong Kong Island along the tramway, by installing a monitoring unit on a tram car for a year’s worth of constant monitoring. Even in Eastern District, where there was less traffic, the PM2.5 levels exceeded the international standard for more than 80 days in a year, the study found. “The study offers another set of data to confirm the air pollution in the city is very serious,” said Simon Ng, chief research officer of Civic Exchange, a think tank that worked with the University of Science and Technology on the research. Ng cited an earlier University of Hong Kong study that suggested older people were particularly vulnerable to the pollution, which could lead to respirational problems and heart conditions. The new study, conducted between March last year and February this year, also found that areas with good ventilation and lower buildings helped to dispense the pollution. The World Health Organisation’s recommended standard for PM2.5 is 25 millionths of a gram per cubic metre daily, and 10 millionths of a gram per cubic metre as an annual mean. 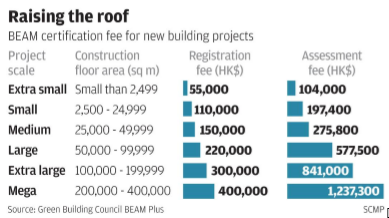 But Des Voeux Road has the highest concentration, registering 55 millionths of a gram per cubic metre as its annual mean, followed by Hennessy Road between Tonnochy Road in Wai Chai to the west and Yee Wo Street in Causeway Bay to the east. In general, Central and Causeway Bay exceeded the WHO daily standard for almost 280 days in the yearlong study. But areas around spacious Victoria Park contained lower levels of the harmful particles than Yee Wo Street, which is congested with tall buildings, despite heavy traffic in both areas, the study suggested. Professor Jimmy Fung, head of HKUST’s Division of Environment, said good city planning would help to ease the pressing problem. “The government should devise a long term strategy to improve wind and air dispersion in urban street canyons with every new development and urban re-development opportunities. “He said pedestrianisation scheme and low emission zone should be considered in locations where roadside air quality is really bad, such as Des Voeux Road West, Hennessy Road and King’s Road. Further doubts have been cast on the running of Chek Lap Kok airport’s proposed third runway, after the Civil Aviation Department said it would abandon a key flight path planned for aborted aircraft landings on the strip. Routing planes over a firing range used by the People’s Liberation Army and police in Castle Peak, Tuen Mun, situated under the proposed missed- approach route, proved too challenging. The department announced on Monday it had given up on this route – recommended by its British consultants – due to “technical issues”. The Post revealed last month how the firing range posed a hazard to planes and that frequent shooting threatened to reduce the airspace available and limit the number of aircraft that can land. At present, the airport’s two runways can handle 67 planes an hour. A third runway would see that capacity increase to 102. A spokeswoman denied the issue was directly related to the firing range but reiterated it would comply with International Civil Aviation Organisation rules. One of the few alternative flight paths for aborted landings would force planes arriving from Macau to make a sharp U-turn, coming immediately into conflict with planes approaching Shenzhen airport. Michael Mo Kwan-tai, spokesman for the Airport Development Concern Network, said: “The CAD has taken a huge gamble in assuming the Shenzhen authorities would give way to missed-approach aircraft in order to give maximum capacity to the three-runway system. “If Shenzhen will not give way, or in any circumstance the Pearl River Delta [airspace] integration plan does not include approval of this U-turn missed approach, the third runway will be screwed up,” he added. Former aviation department chief Albert Lam Kwong-yu said to enter Shenzhen’s airspace, the department “must have agreement and consult its authorities”. The sharp U-turn into mainland airspace is the only other flight path offered by the National Air Traffic Service that complies with global aviation laws. Consultants carved out the “escape route” after assuming airspace would be merged with the Pearl River Delta and that the firing range would be shut down. Three-quarters of parents with at least one child under the age of three report that the child has allergies, a study shows – and researchers warn the figure will grow. Some 58 per cent of the youngsters had eczema or a skin allergy, 32 per cent had rhinitis or hay fever and 25 per cent airway allergies such as asthma. Some of the children suffered more than one type of allergy. The findings of the survey by the Allergy Association, commissioned by the University of Hong Kong, were based on interviews with 511 parents. Only 30 per cent of the children were believed to have inherited the condition from their parents – meaning the rest might be down to factors such as pollution, exposure to second-hand smoke, caesarean delivery or not being breastfed exclusively in their first six months. “We have seen many more allergy cases in this generation than the last,” said Dr Marco Ho Hok-kung, chairman of the association. Allergies could affect the long-term growth of infants, said Ho. Some research suggests that infants who develop an allergy before the age of two have a 24 per cent increased risk of developing emotional problems later in life. Families with children suffering from allergies often have to devote a lot of effort to preventing exposure to allergens such as peanuts, milk or seafood in meals and dust mites at home. According to the World Health Organisation, 40 to 50 per cent of children across the globe are bothered by one or more types of allergy. Ho said if either parent had an allergy, there was a 30 per cent chance of their child inheriting it. This increased to 50 per cent if both parents were sufferers. And in general, every child has 5 to 15 per cent chance of developing an allergy even if neither parent has the condition. Paediatrician Dr Alfred Tam Yat-cheung said risks could be attributed to environmental factors such as pollution and exposure to second-hand smoke. They could be reduced by giving birth naturally and feeding the babies only breast milk in their first six months, he said. Thomas Chu Ka Wa, writing on April 24, says that “we must recognise that the future demand on the airport is strong and can be met only with new hardware” (“No basis for opposing third runway”). He goes on to suggest that the arguments of the opponents do not stand up to scrutiny as “we can all analyse the data and information available”. Mr Chu’s “strong demand” and “data available” springs from past figures and trends to project a hypothetical future. The same approach was adopted in 2004 in the Port 2020 study – a projection which showed that we needed an additional container terminal. The reality is, of course, vastly different – our once great port has succumbed to external market realities which were even then apparent to anyone with a less partisan view – and it is indeed fortunate that sane heads prevailed in this rare case and we were not saddled with another costly white elephant infrastructure project. Our airport business is particularly vulnerable. If the one-third that stems from transit passengers is replaced by direct flights through new air service agreements with mainland China – as is a distinct probability – then we lose this leg of the stool. If the one-third that derives from air cargo falls away upon the decline of manufacturing in the Pearl River Delta – as is already happening – then another leg becomes shaky. And to assume that a city of but 7 million people will of itself fill the gaps thus lost in aircraft movements is extreme folly. There is indeed a role in analysis of past trends, but it is unwise to adopt this without due rigour. The Port 2020 study demonstrated how a failure to examine the wider picture could have led us into a very costly blunder indeed. I have read the detailed official analysis and justification for the third runway, and it is this case made that does not stand up to the scrutiny that Mr Chu suggests we all take. The assistant director of civil aviation tells us that our airport will reach its upper limit of 68 air movements at the end of the year (“UK air traffic system not useful here”, April 27). However, my understanding is that the limit of our two runways is actually about 80 but this cannot be reached because the central government has not sanctioned northward routes for departing aircraft. This limitation has been in place since the days of planning and has shown no signs of being lifted. Does it not seem to be unwise to commit HK$140 billion on what is still only hope that this decision will be reversed to allow for full use of three runways: about 120 movements? It will, of course, conform with the degree of foresight applied before government projects proceed in Hong Kong. We already have a cruise ship terminal with no cruise ships, so why not a third runway with no aeroplanes? The new study was published today by the WHO Regional Office for Europe and the Organisation for Economic Co-operation and Development (OECD) as a 3-day high-level meeting on environment and health in Europe opens. Over 200 representatives from European countries and international and nongovernmental organizations gather in Haifa, Israel, on 28–30 April 2015 to look at achievements, gaps and challenges and set future priorities. Economic cost of the health impact of air pollution in Europe is the first assessment of the economic burden of deaths and diseases resulting from outdoor and indoor air pollution in the 53 countries of the Region. The economic cost of deaths alone accounts for over US$ 1.4 trillion. Adding another 10% to this, as the cost of diseases from air pollution, results in a total of almost US$ 1.6 trillion. In no less than 10 of the 53 countries of the Region, this cost is at or above 20% of national GDP (see Annex for data by country). The study uses the methodology applied in a 2014 report by OECD and makes the calculations based on the most recent economic estimates of the health impacts of air pollution. The economic value of deaths and diseases due to air pollution – US$ 1 600 000 000 000 – corresponds to the amount societies are willing to pay to avoid these deaths and diseases with necessary interventions. In these calculations, a value is attached to each death and disease, independent of the age of the person and which varies according to the national economic context. “About 2500 people are estimated to die in Israel annually as a result of exposure to air pollutants. The main source of air pollution is transportation, mainly in major city centres,” says Mr Ofir Akunis, Deputy Minister of Environmental Protection and Member of Knesset (Parliament) for Israel. “Since 2011, the Ministry of Environmental Protection’s Clean Air Law regulates pollutants from major sources such as transport, industry and energy in accordance with the most stringent standards. The Ministry aims to use all available resources to reduce air pollution, as this means saving the lives of thousands of people, as well as billions to the Israeli economy”. The cost of the health impacts of air pollution is only one of many studies that will provide evidence on the environmental impacts on health to be released at the Haifa meeting. Another new report, Improving environment and health in Europe: how far have we gotten? jointly published by WHO and UNECE, informs that one in four Europeans still falls sick or dies prematurely from environmental pollution. Data from several surveys in priority thematic areas such as water and sanitation, air quality, the day-to-day surroundings of children’s lives, chemicals and asbestos, climate change and health inequalities all show that while progress has been remarkable, it has been uneven (see Fact Sheet on the report). Long-term exposure to fine particle air pollution, even at low levels, may cause subtle structural changes in the brain that could precede cognitive impairment and hidden brain damage, according to research in the journal Stroke. Between 1995 and 2005, researchers tracked 943 adults from Boston and throughout New England and New York, who were relatively healthy and free of dementia and stroke. They found a 2 microgram per cubic metre of air increase in PM2.5, a range commonly observed across a metropolitan region, was associated with a 0.32 per cent smaller total cerebral brain volume – similar to about one year of brain ageing – and a 46 per cent higher risk of covert brain infarcts, a type of silent stroke. Fine particle air pollution, or PM2.5, comes from burning wood or coal, car exhaust and other sources. To most, Denmark brings to mind popular TV dramas, sweet pastries and Lego. But there is one part of the nation’s identity that those in Borgen (the real-life seat of government, that is) are keen to eradicate. For some decades now, Danish waste management has been dominated by municipal incinerators. Plants were common in the small dormitory towns that popped up in the 1960s, but it was the energy crises of the 1970s that persuaded the Danish government to promote district heating, reducing dependency on oil and increasing supply reliability. This district heating, created by waste- burning plants, now provides around 20 per cent of energy to Danish homes, and up to 98 per cent of households in Copenhagen. It is perhaps this reliance on incineration that is behind the staggering amount of household waste produced: it’s currently hovering around the 2.5 million tonnes per year mark (as of 2011), after exceeding 3.5 million in 2008. In a nation of 5.7 million inhabitants, that’s around 450 kilogrammes (kg) per person. Indeed, according to Eurostat, Denmark’s municipal waste generation per capita is the highest in Europe, 747kg per person in 2013 (compared to a Europe-wide average of 481kg). Around 80 per cent of this household waste, including high-calorific organic waste, is sent straight to the nearest incinerator (only three per cent is sent to landfill nationwide), with seemingly little appetite or need to develop more efficient processes. Although the Danish brand of incinerator might not be the ozone clogger that you envision – high filtration and cleaning standards see to that – it was this vicious circle of generating waste for energy that former Environment Minister Ida Auken aimed to cut off when her department introduced the ‘Denmark Without Waste’ plan in November 2013. The plan signals a move away from incineration and towards a more recycling-oriented system. With the plan comes a relatively bold target: to double household recycling – from a paltry 22 per cent in 2011 to 50 per cent by 2022 (although, strangely, the European Commission’s revised Waste Framework Directive requires this target to be met two years earlier). The plan’s focus is on getting more out of waste. Measures include separate collection of organic waste for biogas and other biomass uses, higher quality recycling of construction waste, and an increased focus on developing recycling technology. It aims to reduce the amount of waste sent to incinerators from over 2.5 million tonnes in 2011 to just 820,000 tonnes by 2022. With household waste making up such a large proportion of incineration feedstock, however, the change must start at home. “There’s been a paradigm shift and it’s been important for us to really explain the story”, says Auken. “That’s why we changed from saying we make waste plans to saying we make resource plans. We’ve really tried explaining to the people why we ask them to separate their waste now. “We’ve focused a lot on resource scarcity and how the prices have come up in the last 15 years more than they went down in the previous hundred. We’re trying to show that there are jobs and new technologies combined with this change. Changing the mindset of the people is just the first step in initiating change, and Auken is confident that Denmark is ready for a new way of operating centred around creating a circular economy. New business models are popping up all over Denmark and are, she says, “very appealing to people”. But creating a collection system and the infrastructure to put these materials to best use is another issue altogether. Auken’s ministry suggested a focus on more waste streams – for example, better collection and separation of WEEE and higher quality recycling of construction waste – but for the time being municipalities have the freedom to develop their own methods, as long as they’re working towards the government’s targets. “Setting a recycling goal that’s twice as high [as current levels], it was important municipalities didn’t just point to the government and say: ‘They said it.’ They really have to take responsibility, so we gave them the freedom to implement the way they start”, Auken explains. What happens to the waste once it’s been collected, though? Auken acknowledges that creating waste streams that are valuable enough to create a market is a challenge that requires everyone to chip in. “You need government’s priorities, you need private companies with the technologies, you need private buyers of the recycled materials, you need to bring all these interests together.” But Denmark is ready, and the response from businesses has been positive, according to Auken; already, some municipalities have created biogas plants to treat organic waste, and the government hopes that their success will encourage more to follow suit. So now that Denmark is seemingly on its way to kicking its incineration habit, how does government ensure that it doesn’t make a similar error and commit to new practices that seem wonderful now but are obsolete or burdensome in a few years? Flexibility, Auken insists, is key: “You can never ensure that you don’t create a new problem when you solve an old one. You need to solve several at a time – that is normally the best way to go around. That, and being a politician in a leadership that is not afraid of changing tools on the way. If we have a goal that is Denmark without waste in 2050, we should not predict the extent of available technologies” – a lesson learned from the past few decades. This evolution is already evident. The Ministry of the Environment, now headed by Kirsten Brosbøl after a change of cabinet last February, plans to follow up 2013’s waste plan with ‘Denmark Without Waste II’ this year. The sequel takes a step up the waste hierarchy, addressing the prevention of waste.